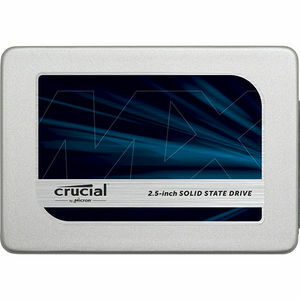 Increase the speed, durability, and efficiency of your system for years to come with the Crucial MX300 SSD. Boot up in seconds and fly through the most demanding applications with an SSD that fuses the latest 3D NAND flash technology with the proven success of previous MX-series SSDs. Your storage drive isn't just a container, it's the engine that loads and saves everything you do and use. Get more out of your computer by boosting nearly every aspect of performance. The Crucial MX300 reaches read speeds up to 530 MB/s and write speeds up to 510 MB/s on all file types so you can boot up almost instantly, reduce load times, and accelerate demanding applications with ease. Plus, our Dynamic Write Acceleration technology uses an adaptable pool of high-speed, single-level cell flash memory to generate blistering speeds throughout the drive's long life. Extreme Energy Efficiency technology within the Crucial MX300 reduces the amount of active power usage that's consumed by the drive. The Crucial MX300 extends your laptop's battery life by using only 0.075W of power, compared to a typical hard drive which uses 6.8W. With an endurance rating of up to 220TB total bytes written, the Crucial MX300 is engineered with Micron 3D NAND to deliver years of fast performance. The 3D NAND leverages larger NAND cells to improve performance and prolong endurance. In addition to lower active power usage, Adaptive Thermal Protection technology dynamically adjusts storage component activity. This helps keep your system cool and minimizes the risk of damage caused by overheating. This downloadable tool is easy to use and helps monitor and enhance the performance of your Crucial MX300 - update to the latest firmware and enable the Momentum Cache feature in Storage Executive to instantly improve burst performance. As a brand of Micron, one of the largest flash storage manufacturers in the world, the Crucial MX300 is backed by the same quality and innovation that has produced some of the world's most advanced memory and storage technologies. With over a thousand hours of prerelease validation testing and hundreds of SSD qualification tests, the Crucial MX300 has been thoroughly tried, tested, and proven. You'll notice the difference.